The clerk pulled a baseball bat on a masked man in Guilford and chased him away. A store manager in Guilford fought back after a robber barged in and demanded money and it was all caught on tape. Cameras were rolling inside the Sunshine Daydream Hippie Shop when a masked men showed up on Monday night. Surveillance showed him jump on the counter and try to pry open the cash register. The man had no luck, so he walked to the other room and found the store manager. Seconds later, the robber demanded that the manager hand over the money. “Open the register, I’m not joking around I’m serious. Pay attention, do it,” the manager who wanted to be anonymous said as he described the crook's demands. 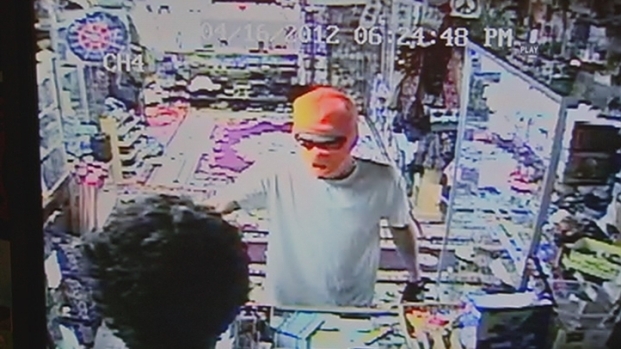 A store manager in Guilford chased off a masked robber with a baseball bat. The encounter was caught on surveillance video. He didn’t give in to the orders, and that’s when the robber became agitated and reached into his pocket. The manager thought he was getting a weapon. “I was waiting for him to pull out a knife, but he pulled his hand out after a second and he didn't have anything in it,” the manager said. That’s when the manager grabbed a baseball bat that was hanging just inches away. The risky move worked. “He saw me grab the bat and he just turned around and started running,” the manager said. Surveillance video shows the robber rushing out the front door and the manager wasn’t far behind. “I just acted on instinct pretty much,” the manager explained. The manager said he tried chasing down the robber, but the man hopped into a getaway car he parked down the way and drove off. “He set it up in a way he thought would work out, but it didn't really,” the manager explained. Guilford Police said just because the plan to rob Sunshine Daydream didn’t work, doesn’t mean this man won’t target other local businesses and put workers in danger. “If he had a gun, he could have seriously injured me,” said the manager. He got a good description of the robber's car and gave it to investigators. He said he hopes officers catch the man before this happens again. Police said the robber was driving a reddish-brown older model Cadillac with a dent on the back. The car was last seen going west on Boston Post Road toward Branford.